Never say no to a recipe again. I’ve become something of an expert at changing recipes to meet dietary needs. I grew up in a family that couldn’t mix milk with meat products due to religious reasons, and later in life, I cut out meat from my diet entirely. But when you’re really obsessed with food and cooking, it becomes frustrating to flip through pages of magazines and cookbooks, eliminating recipes based on one or two off-limits ingredients. I never wanted to pigeonhole myself to just vegetarian cookbooks. Nowadays, it’s super mainstream to have some kind of restriction(s) when it comes to eating, and it’s almost too easy to find viable replacements for your no-go foods at the local supermarket. The key is feeling confident enough to swap in the right alternative ingredient. Sometimes it takes a little experimenting to find the right fit, but rest assured, once you commit to taking on a bit of trial and error, you’ll be dining on dishes you never thought possible in no time. Try these swaps to give yourself ample flexibility in the kitchen while staying within your dietary parameters. One of the easiest swaps in vegetarian cooking is using vegetable stock in place of meat stock, and this will open up a ton of recipes. When it comes to a rich, broth-based dish like ramen, it’s best to use a more flavorful mushroom stock over vegetable. If a recipe calls for beef stock, add a touch of red wine for depth. When a recipe calls for bacon, the simplest fix is to simply add smoked paprika or a touch of liquid smoke to taste just achieve that signature smokiness. If you crave a little more of a meaty-element, tempeh bacon works wonders. You can make your own or buy it in the refrigerated section of your favorite supermarket. For even more textural similarity, coconut bacon or jackfruit bacon bring a comparable umami crispness. And don’t cross off recipes that highlight meat as the main event just yet. Chicken can often be swapped in for tempeh or seitan. This typically comes down to preference, but I usually go by the following informal guideline: If the recipe calls for chicken cut into pieces, I’ll opt for tempeh and if it’s a full piece of poultry in the dish, I’ll go for seitan. Seitan has more textural similarities to chicken, but tempeh is easier to find, cheaper, and takes on a flavor better. In addition, jackfruit is nearly indistinguishable from shredded meat in many recipes, and cauliflower or eggplant can be breaded and cooked like an animal protein. Red meat can be a little bit tricky, because there’s nothing quite like it. For stews and sauces, I typically substitute in lentils or ground mushrooms. If I’m looking to go that extra step, I’ll substitute ground meat with meatless veggie crumbles. If a recipe calls for a larger piece of red meat, like steak, a cauliflower, mushroom, or eggplant steak can go a long way. Alternatively, extra-firm tofu or seitan can do the trick. One of the most challenging swaps when it comes to seafood is replicating fish-containing sauces. Fish sauce or oyster sauce can be replaced with a mixture of soy sauce and miso. It won’t have the fishy element, but it will bring a touch of the salty and fermented flavor you’re looking for. Similarly, worcestershire sauce can be replaced with two teaspoons of soy sauce mixed with ¼ teaspoon lemon juice, a bit of sugar, and four drops of hot sauce. When it comes to whole pieces of seafood, mushrooms make for the best textural swap, because they have a similar meaty, yet smooth, mouthfeel. Swap in king oyster mushrooms (also known as trumpet mushrooms) for shellfish like scallops, shrimp, or oysters. Extra-firm tofu makes a great replacement for a whole fish fillets, though flavor-wise they may need some extra TLC. Lastly, dishes that require flaked fish, like crab cakes or dip can usually be replaced by chopping artichoke hearts and mixing with crumbled seaweed. For a seafood-based salad, like tuna, lightly mashed chickpeas make for a great replacement. It’s almost too easy to find gluten-free alternatives anymore. Most pasta recipes can handle gluten-free pastas, soy sauce can be replaced with gluten-free tamari or coconut aminos, and most any bread product one can imagine has a readily available gluten-free counterpart. When it comes to sauces, teriyaki sauce can easily be replaced with a mixture of gluten-free soy sauce mixed with honey or maple syrup. For other soups and sauces that require flour as a thickener, utilize cornstarch instead. For recipes that star bready products like wheat tortillas, you can use corn tortillas or lettuce wraps as a replacement. 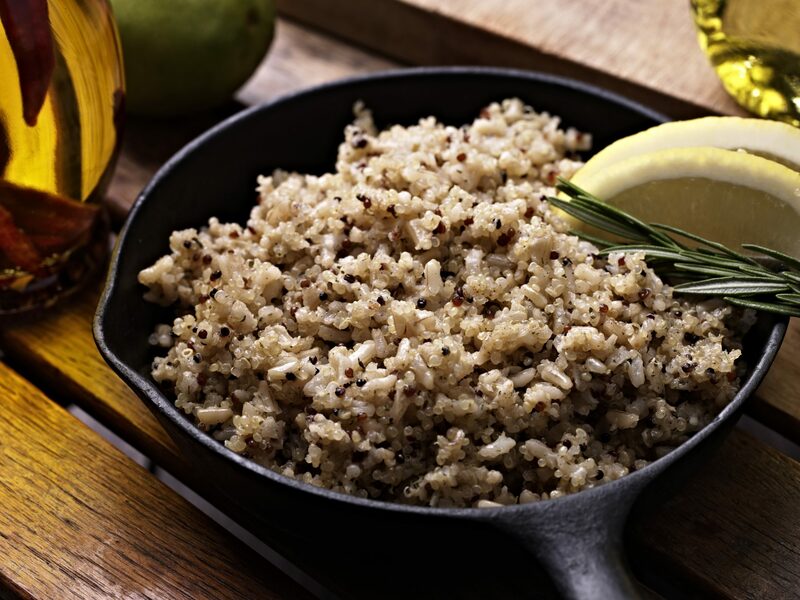 Grain bowls or sides that call for wheat-based ingredients like farro or couscous can easily be adapted to use quinoa or rice. In addition, polenta makes for a great base instead of bread, bagels, or pizza. Keep in mind that breaded foods, like eggplant parmesan, are easily made with gluten-free varieties of panko or breadcrumbs. Alternatively, you can grind corn flakes, potato chips, or uncooked quinoa, for a similar texture. For dishes that use breadcrumbs as a binder, like salmon croquettes, you can use cooked quinoa as a replacement. My family was reaching for dairy-free alternatives long before it was cool (I see you, tofutti). Though there are tons of dairy-free milk, butter, cheese, and yogurt alternatives out there, sometimes you still need a smart swap up your sleeve. You can easily use unsweetened soy or nut milk instead of cow’s milk in most recipes. For recipes that call for heavy cream or evaporated milk, you can cook down nut milk until it’s the right creamy consistency. In addition, buttermilk can be replicated with almond milk and a dash of lemon juice or vinegar for tang. Silken tofu is the ultimate dairy-free ingredient. It makes smoothies thick without yogurt and stealthily replaces ricotta, cream cheese, or sour cream in most recipes. Alternatively, avocado can work well as a creamy topper in dishes instead of sour cream, and nutritional yeast adds a savory, cheesy element to recipes without dairy. One of the hardest dairy replacements is swapping out butter in baked recipes, other than vegan butter or margarine. Vegetable shortening works especially well in pastries, as does canola or coconut oil in many baking projects. Nuts usually aren’t entirely necessary to the success of a dish, so you can usually cut them out entirely without worry, or simply swap in a nut you can consume. Otherwise, oats or seeds, like pumpkin and sunflower, offer a similar crunch in dishes, while sesame seeds provide a great nutty flavor. When it comes to replacing other nutty ingredients, almond extract can typically be swapped with vanilla extract. Nut butters are often essential to the flavor of a dish, so a spoonful of sunflower butter or tahini (sesame seed paste) should do the trick for replacing a tree nut-based spread. You can smoothly swap in another meat product, like chicken, for tofu or tempeh without any issue. Soy milk can be traded for a nut milk, and miso's umami, fermented flavor can be exchanged for a dash of fish sauce. Lastly, soy sauce can be swapped with coconut aminos or beef broth with a little sugar added for sweetness. It’s pretty common to find vegan egg substitute or flax eggs available in specialty markets, but there are still some feasible swaps you can make at home. When it comes to a basic breakfast, like scrambled eggs or an omelet, seasoned tofu typically does the trick. You can either crumble up extra-firm tofu for a more traditional feel, or use silken tofu for a runny, soft scrambled egg. Alternatively, this special aquafaba mixture makes for an awesome egg replacement in many applications. If you’re looking to replace mayonnaise in sauces and dressings, there are a few eggless varieties on the market. Otherwise, sour cream or plain Greek yogurt can often stand in its place. When it comes to baking without eggs, sweet recipes can take one overripe banana, half of a very ripe avocado, or ¼ cup of applesauce per egg as a replacement. This works best with baked goods that take on other strong flavors, like a chocolate dessert. If you need egg whites, aquafaba does an excellent job standing in for many uses.